A Wolf by any other name…………………………………………. Lyceon Pictus, literally meaning “painted, wolflike animal”, is an apt name for the graceful and spectacularly coloured wild dog, also known as painted dog, painted wolf, or African hunting dog. Many similarities can be found between African wild dogs and the wolf of northern climes, especially in the social structures of the packs. 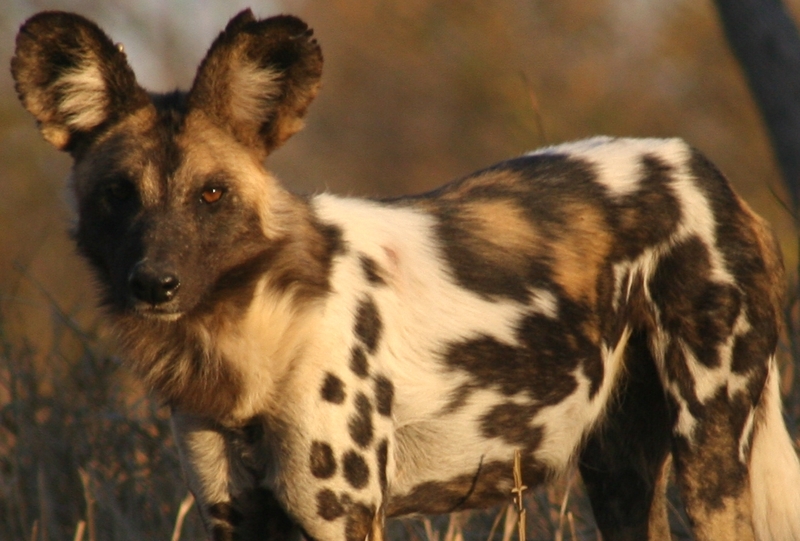 The wild dog’s coat, thick and soft in these southern areas of Africa, is a gaily splashed tricolour combination. Black, gold and pure white vie for the precedence and each dog is uniquely marked, no two alike save for the ends of their lush tails, which are nearly always white. Tall, lean and long legged, with astonishingly large, round black ears and elegant black mask like faces, these animals are a painters dream of movement and colour. My dream….. In the years that I have been writing about, watching, sketching and painting these wild dogs, I have never wearied of my passion for these graceful and seriously endangered animals. The Save Valley Conservancy is where I am privileged to live with Clive Stockil and this is where the wild dog population has slowly been gaining strength after many years of persecution and misunderstanding. Prior to the establishment of the Conservancy in 1991, wild dogs were seldom seen in this area. We also live adjacent to the Greater Limpopo Transfrontier Conservation Area, GLTFCA, which comprises of Gonarezhou National Park in Zimbabwe, Limpopo Park in Mozambique and Kruger Park in South Africa. Gonarezhou is supporting a healthy and growing population of wild dogs. Even so, due to various human pressures and attitudes, domestic diseases and natural predation by other predators, African wild dogs are highly vulnerable and endangered in all the areas where they exist, and deserve our continued protection.